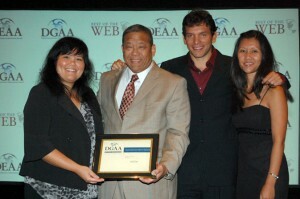 The Judiciary and Hawaii Information Consortium’s (HIC) joint collaboration, the electronic bench warrants system (eBW), received a 2010 Digital Government Achievement Award from the Center for Digital Government as one of the best state government-to-government websites in the country. The award ceremony was held on September 17 and attended by honorees from government agencies nationwide. Dana Nakasato, JIMS Specialist, and Calvin Ching, Legal Documents Branch Court Administrator, traveled with HIC representatives Russell Castagnaro and Janet Pick to Hollywood, California to receive the award. HIC is the Internet Portal Manager for the State of Hawaii. “It was truly an honor to receive the award on behalf of the Judiciary. The success of the project was due to the collaborative efforts of all the people from the Judiciary (especially the District Court and JIMS), eHawaii, the Department of Public Safety and the County Police Departments. It was our belief that eBW was innovative, would contribute greatly to government efficiencies and enhance public safety.,” said Calvin. “It is nice to know that experts in the field of government technology thought so too”. eBW was launched in March 2009. It speeds the delivery of traffic warrants from the statewide District Courts to law enforcement by eliminating the manual delivery of paper warrants. The new system has been providing online access to sheriffs at the Department of Public Safety Sheriff Division and officers at the County Police Departments 24-hours a day, seven days a week.